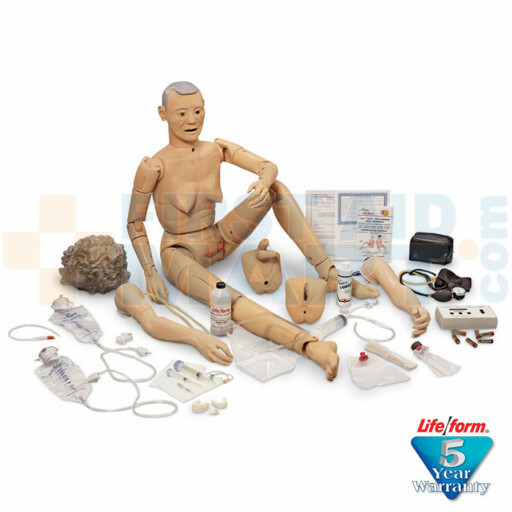 The Advanced Geri Manikin is fully functional with the addition of a right IV Training Arm (LF03214U) and a left Blood Pressure Training Arm (LF03204U). The Life/form IV Arm features replaceable skins and latex veins that actually roll when palpated. A realistic flashback confirms proper needle placement, and the shoulder can be used for intramuscular injection training. The Life/form Blood Pressure Arm reproduces the five Korotkoff sounds and allows the instructor to vary systolic and diastolic levels, pulse rate, volume, and auscultatory gap..
Life/form Advanced Geri™ Manikin - LF04030U.